It's puzzle time in the 3-year-old class at the Momentous School. This illustrated board was drawn and labeled during the flash focus on trauma session at the Changing the Odds conference. David takes a quick break from his puzzle to flash his pearly whites. He's in the 3-year-old class at the Momentous School. Some experts consider childhood poverty a form of trauma. Counselors and directors with a Dallas nonprofit say growing up poor can impact everything from impulse control to anxiety. The Momentous Institute in Dallas offers therapy for kids and teens, and runs a school for children age 3 through fifth grade. In many ways, it’s like any elementary campus -- grinning students are dressed in red polo shirts, walls are plastered with art projects and there are science lessons on evaporation and precipitation. This nonprofit is powered by the Salesmanship Club of Dallas and a few things set the school apart. 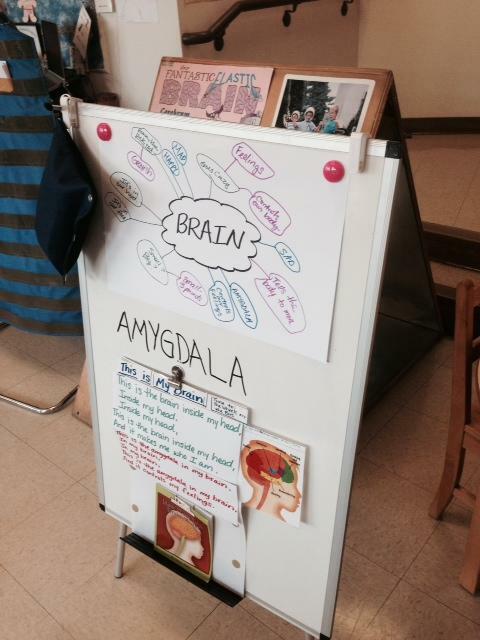 For example, you don’t usually see well-labeled diagrams of the brain in the 3-year-old room. It's also rare to tour a school for the better part of an hour and hear no yelling or crying. The Momentous School is unusual. In order to attend the private school, a child has to be low-income. And emotional health is part of the curriculum. Experts there consider growing up poor a kind of chronic, complex trauma. “That can be perpetual abuse and neglect. It can be living in poverty and the trauma that’s associated with never having enough food for a child," says Jessica Trudeau, director of development for the Momentous Institute. When most people think “trauma,” they think of a terrible motorcycle accident or an act of violence. That’s acute trauma. What kids growing up in poverty experience can be even more corrosive. A diagram posted in the Pre-K room, detailing the fantastic, elastic brain. Kids growing up in poverty are constantly releasing the stress hormone cortisol, which can give them short attention spans and short tempers. Physically, they feel the same kind of heart-pounding stress an adult feels after a car wreck. And they feel it all the time. “If you think about the impact on education, imagine if right after you were in a car crash I walked up to you and said, ‘I need you to take a test.’ Could you do it? Would you perform well?” Trudeau wonders. Counselor Karen Dumas doesn’t think so. She’s a play therapist at the Momentous Institute and says even if you try to hide money problems from young children, they pick up on them. “It’s more about the feeling and the emotion and then tension and the worry and kids pick up on that so much and then they tend to emulate that kind of behavior, and they kind of take it on themselves," she says. This was a big topic at the Momentous Institute’s recent “Changing the Odds” conference. The audience there was full of educators, the group Momentous staffers is desperate to reach. Jessica Trudeau says just getting teachers to view poverty as trauma is half the battle. “We want to encourage everyone to put a question mark on misbehavior," Trudeau says. "Put a question mark on what they normally perceive as an inability to comply with rules and understand just as you yourself as an adult cannot perform in that situation, we certainly cannot expect our children to." And at the Momentous School, they don’t, which might explain why students seem so relaxed. In a room full of 3-year-olds, there's no yelling, no screaming -- just singular focus on wooden puzzles. Financial insecurity and poverty can take a toll, but it can also affect the brains of kids growing up in poverty. The Momentous Institute is trying to reverse that. Michelle Kinder is the executive director of the organization, which runs a school and two therapy programs in Dallas. Sir Ken Robinson, who boasts the most-watched TED Talk of all time, was in Dallas on Thursday for an education conference called “Changing the Odds.” Robinson argues that the current education system has some outdated assumptions about intelligence and creativity. Some communities hover over the financial edge, while others have completely fallen off. Sandbranch, an unincorporated corner of Dallas County, is one of them. Residents there have no internet, no trash pickup and no running water.